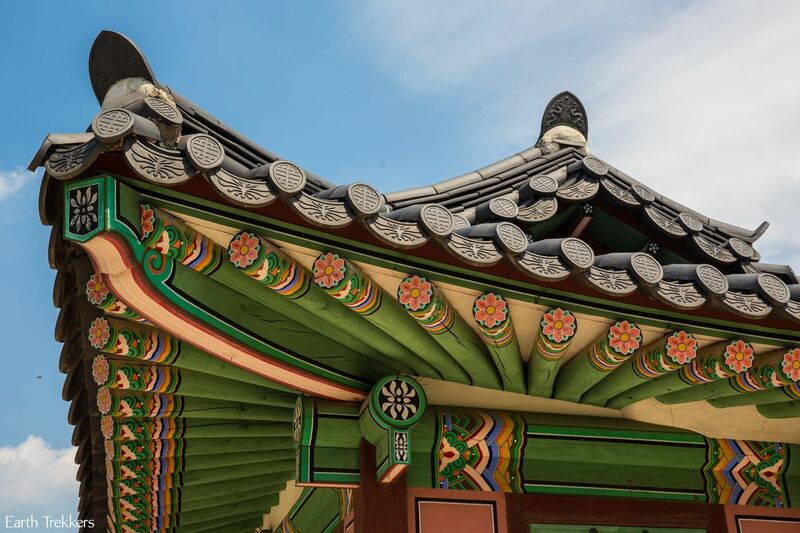 We had just 48 hours in Seoul, just enough time to see the capital of South Korea before flying south to the island of Jeju, South Korea’s playground. 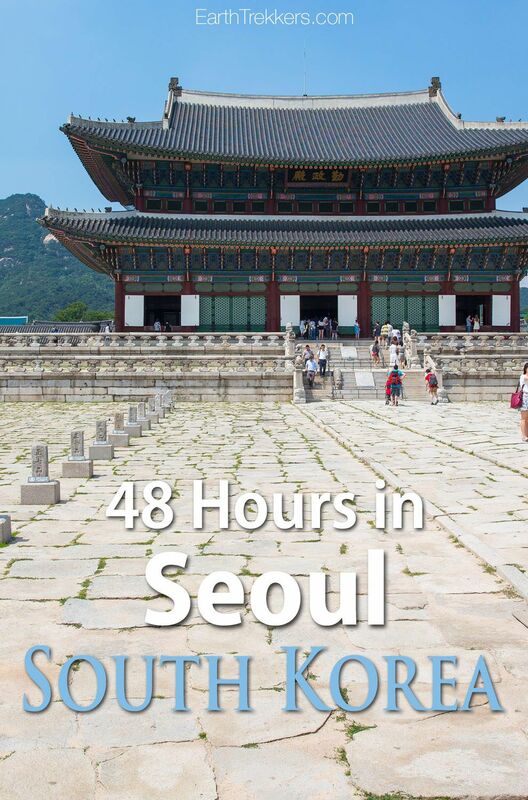 While planning our time in South Korea, I read that there was not much to see and do in Seoul. One day is sufficient and two days are more than enough. At the time I am writing this, we are on our last day in Jeju, and all four of us liked Seoul much more than Jeju. 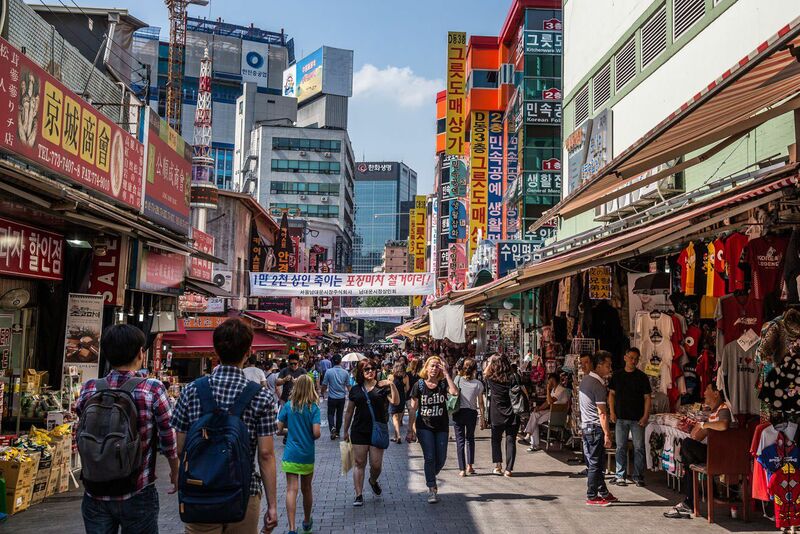 Looking back, I would have spent more than 48 hours in Seoul. 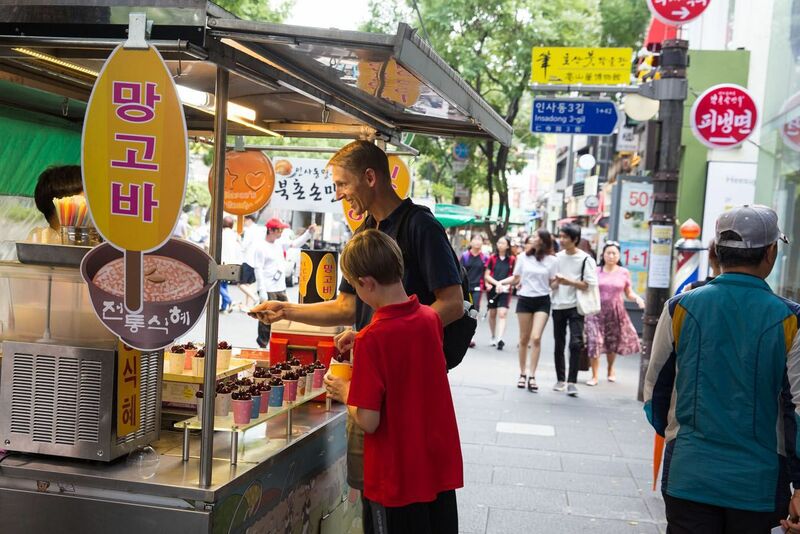 New foods, new sights, new friends…visiting Seoul was an awesome experience. Currently, Seoul is in the middle of a MERS epidemic. For six weeks, South Korea has been in the news, with reports of new cases and deaths everyday. 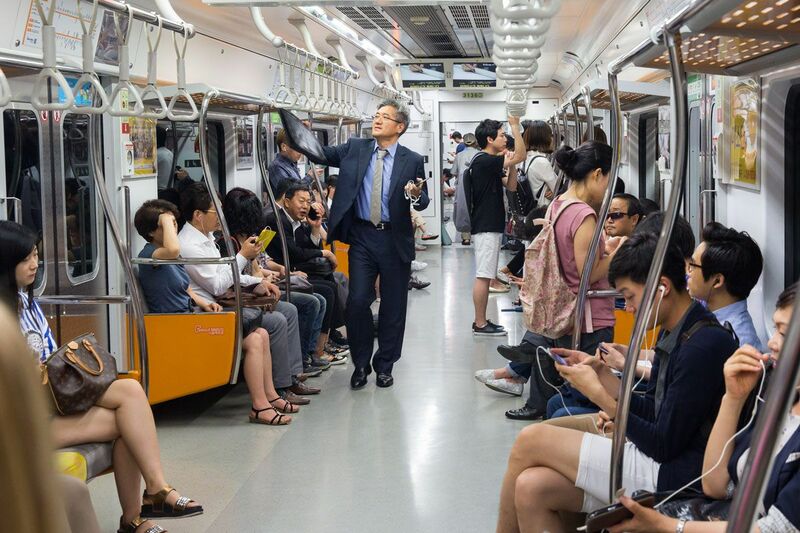 News stations show subway stations filled with people in face masks and some countries are issuing travel warnings against flying to South Korea. 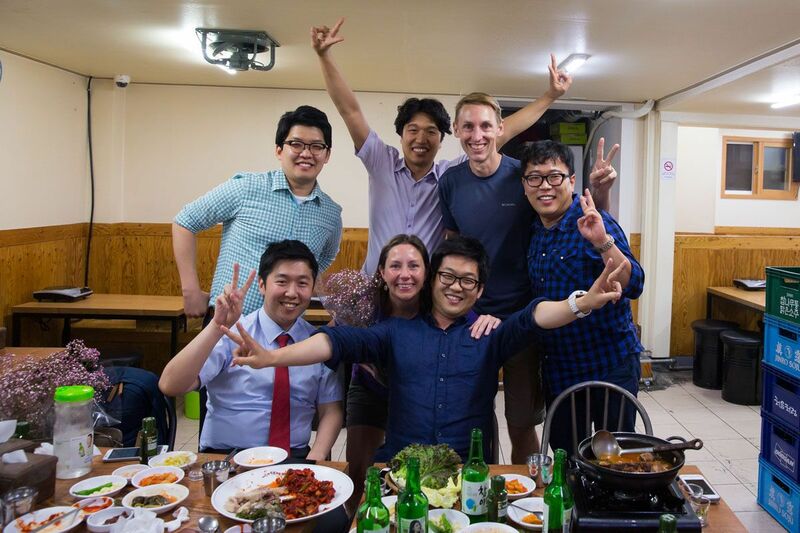 We had this week in South Korea planned for two months now. Our flights and hotels were booked in advance and we were looking forward to this short stopover before hopping over to Japan. As we watched news reports, Tim and I questioned flying to South Korea in the middle of this epidemic. By traveling to South Korea, we took chance, albeit small, that we could spend our two weeks in Japan in quarantine. Catching MERS was not a consideration, as all cases seem to be originating in hospitals. 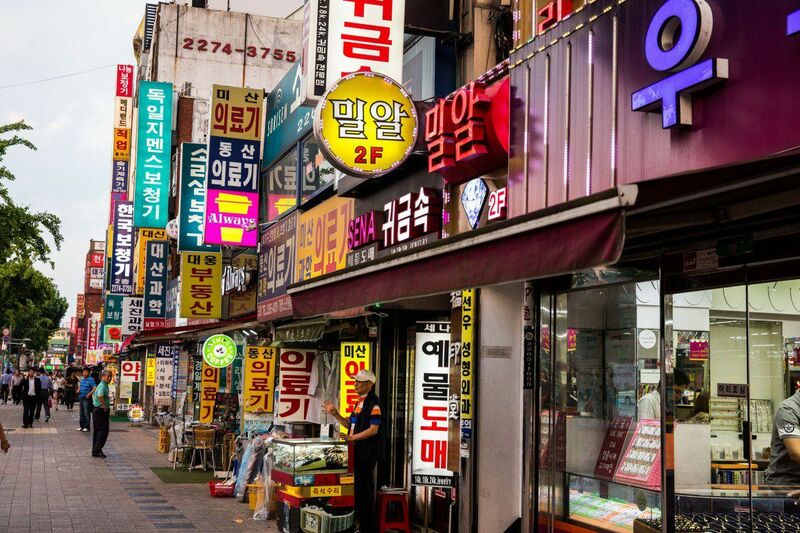 Most tourists had already cancelled their plans, causing a huge blow to South Korea’s economy during their peak season. 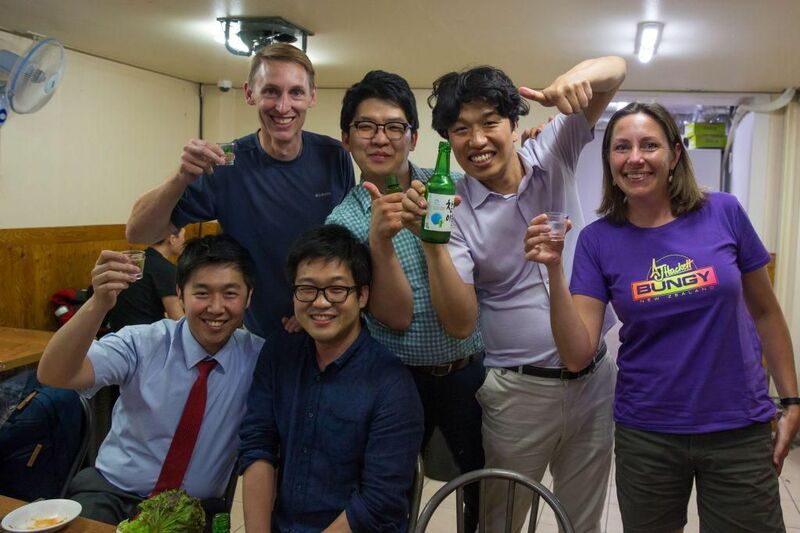 We debated and debated, and even hours before our flight from Kuala Lumpur to Korea we considered changing our plans. Well, we didn’t change our plans, and here we are, so glad we stuck with our original plan. Our visit to Seoul was spectacular. We entered the Incheon Airport at 8:30 am after an overnight flight. Tired and groggy, we walked through the airport, past the quarantine checkpoint for MERS and Ebola, got stamped into South Korea, and made our way to our hotel. 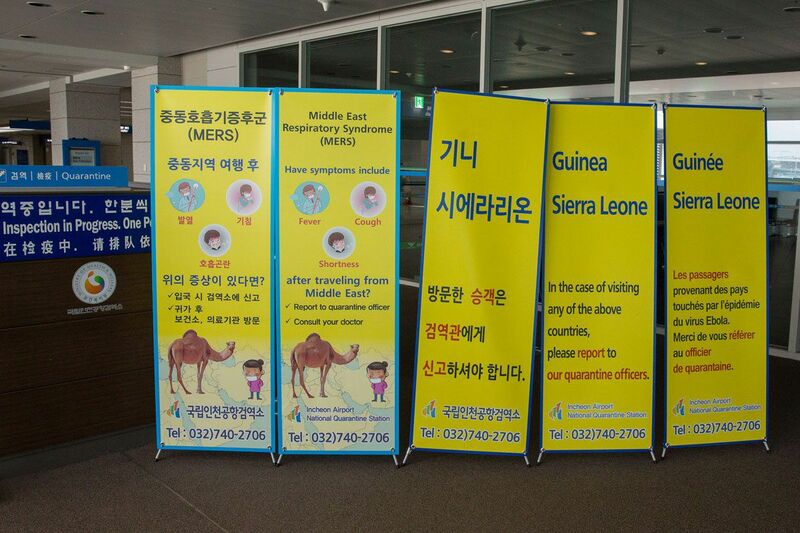 MERS signs, mostly in Korean, were plastered everywhere we went…at the airport, in the subway stations, at temples and palaces, museums, and even in shopping malls. 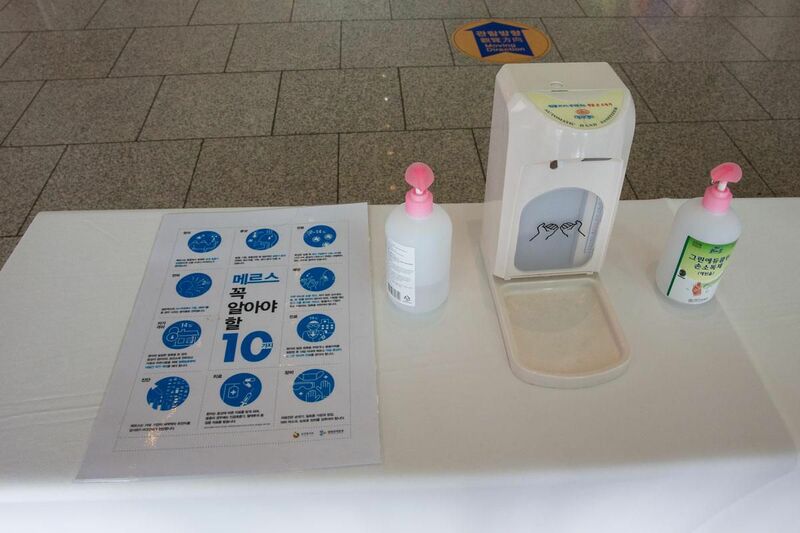 Bottles of hand sanitizer sat on counters everywhere, as South Korea is doing what it can to prevent the spread of MERS and ease the minds of people living and traveling here. I was expecting to see most people walking around in face masks since that is the picture the media painted. This was not the case at all. In fact, once in South Korea, we thought about MERS a lot less than the time leading up to our flight here. 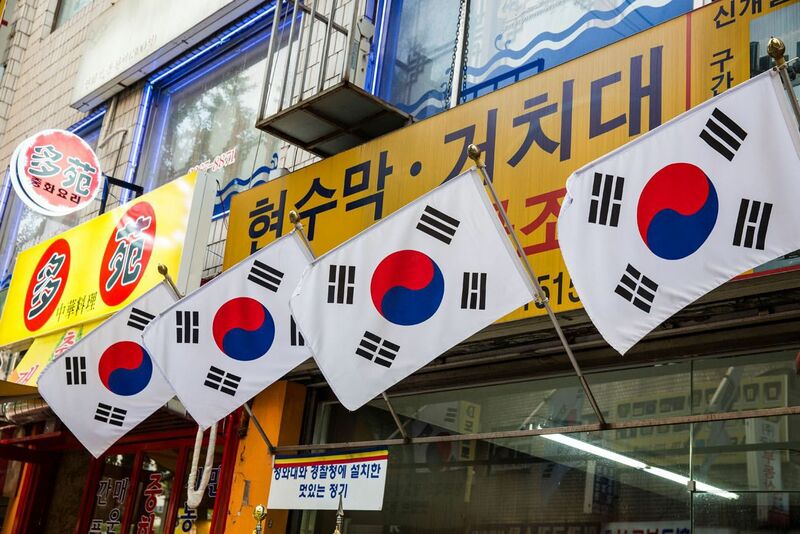 Other than those MERS posters posted around the city, you wouldn’t know that South Korea was in the midst of a health epidemic making international news. 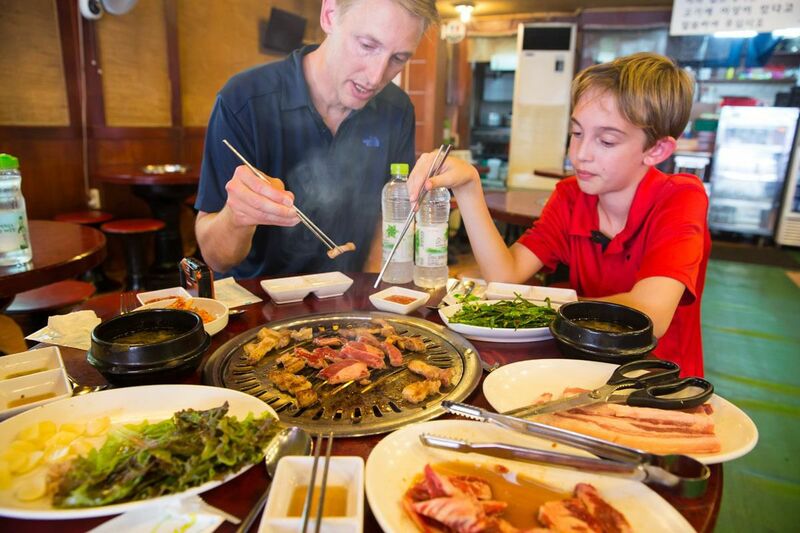 We were told that we must eat at a Korean barbecue during our visit. 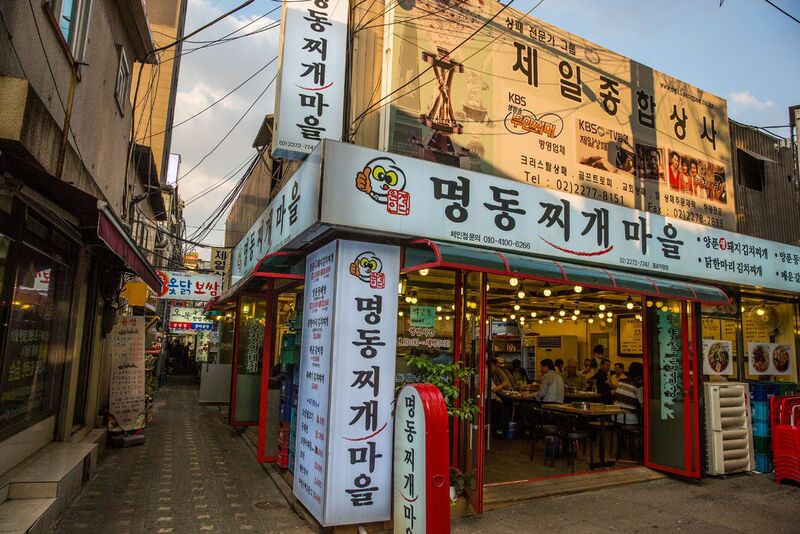 This is where our food tour of South Korea begins. 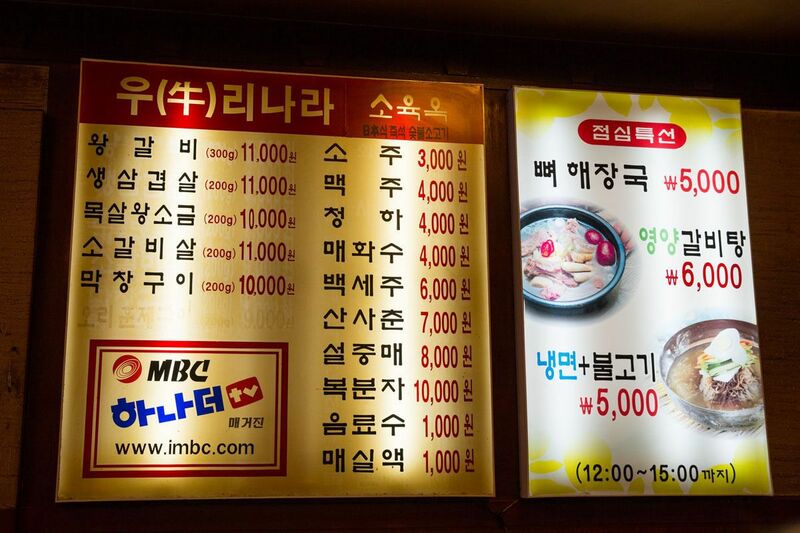 Our hotel staff pointed us to a small barbecue place, a place where the locals go, and wrote down the name in Korean. Unfortunately, I have no idea what this place is called in English. A lot of things would be like this for the next week. We sat down at a small restaurant, a hole in the wall kind of place, with rickety chairs, dirty floors, and an open kitchen area. This was just what we wanted, the real deal.We took our seats at a round table with an open area in the center, which was the grill. The four of us blankly stared at the Korean menu on the wall, wondering how we were going to order when we did not even know what the choices were. Fortunately, a waitress brought over a menu with pictures and English. We picked the beef ribs and the pork belly, hoping for the best. A few minutes later, trays of food were brought out: raw beef and pork, small trays of dipping sauces, lettuce, and a plate of vegetables slightly resembling green beans. Flaming charcoal was placed in the hole and covered with a grill plate. Our waitress, using tongs, put some of the beef and pork on the grill, cooking it. After she had been gone a few minutes, I took the tongs and started to turn the meat over. The waitress rushed back over, chastised me in Korean, and flipped the meat for us. She and I would go back and forth like this several times during the meal, having us laughing and joking that I was always getting in trouble. 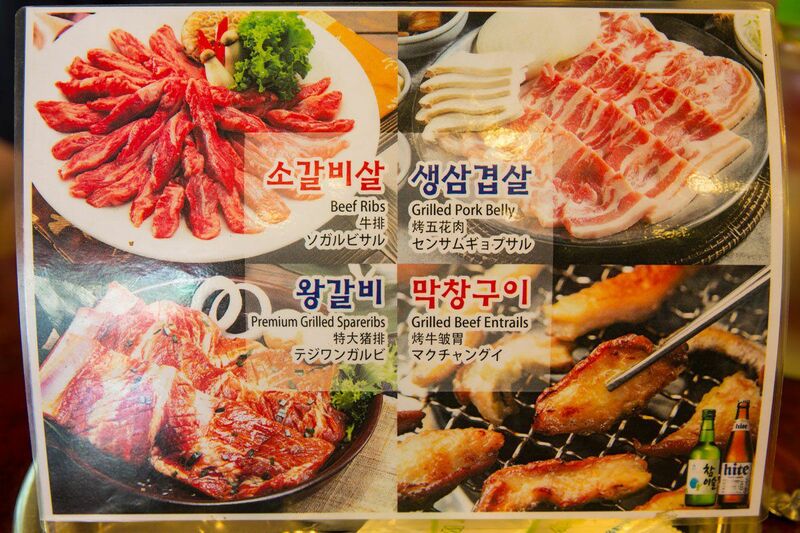 The small pieces of meat are eaten either with the dipping sauces or wrapped in the lettuce leaves with a piece of garlic, kind of like a Korean burrito. Tim and I watched as cooked meat was handled with the same tongs used to handle uncooked meat. As we watched and participated in this, Tim and I both had the same thought, that it would be amazing if we get through this meal without getting sick later (yes, we would all stay perfectly healthy). This was not the cleanest of places and there is no way a restaurant like this could pass an inspection in the United States. It has been like this in so many restaurants in Asia, giving our immune systems a huge boost as we travel. So, what did we think of this meal? It was a fun experience and we like getting a taste of how other cultures enjoy their meals. The meat tasted good but was too fatty for our liking. 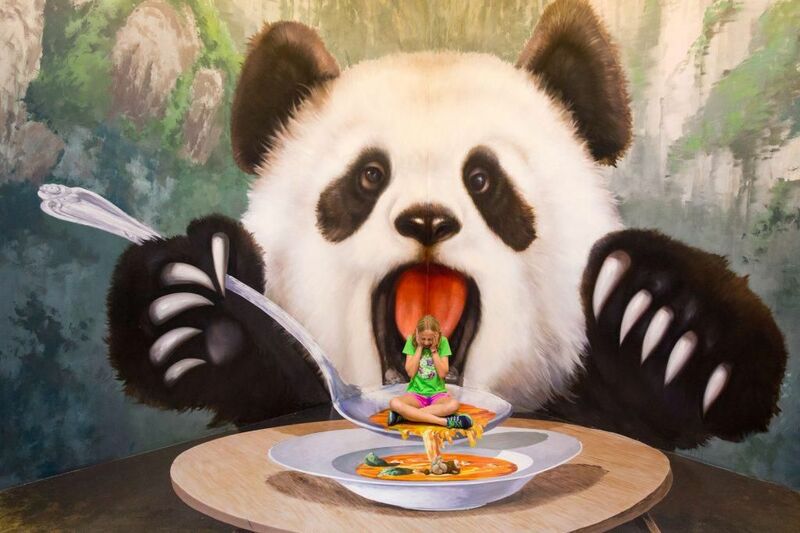 Even though we enjoyed it, this won’t be a meal we will be repeating anytime soon. After lunch, we walked a short distance to the Insadong area of Seoul. This is a popular area to go shopping, particularly for tourists. It didn’t take us long to walk the entire main street. Tyler ate fresh cherries and we all loved the Turkish ice cream shop on a street corner. This ice cream was as much about the experience of purchasing the ice cream as actually eating it. The ice cream was “sticky,” allowing the server to twirl the ice cream and cone around, hand it to Kara, pull it away at the very last second. 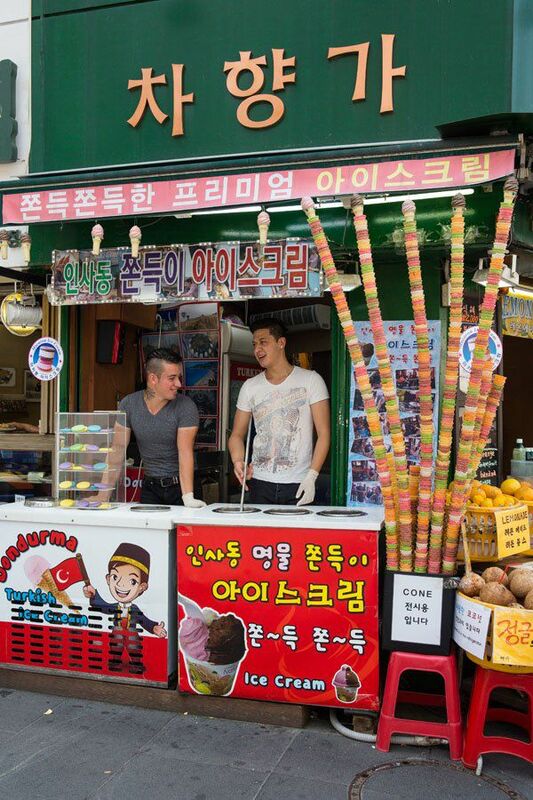 His hijinks and playful attitude had Tyler and Kara laughing and attracted many people to his shop. From the Insadong area we rode the metro to a “local” shopping market at Nandaemung. Here, people were selling and buying clothing and housewares, all very mundane. We were hoping for crazy foods and strange sights and smells, and without those, the four of us quickly grew bored. Time to move on to the next thing. 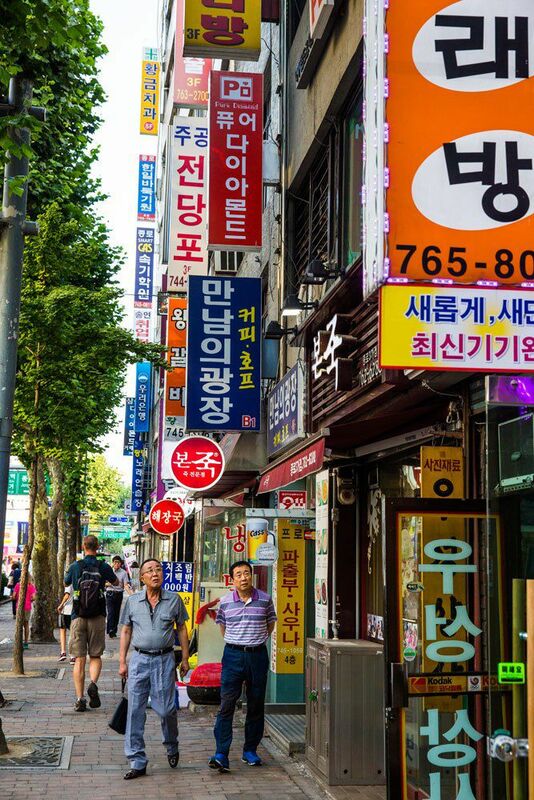 After dropping Tyler and Kara off at our hotel room, Tim and I walked the streets around our hotel, doing a little more exploration of Seoul. It was a cool and breezy evening, perfect for walking the streets and doing some people watching. On our second day we started off at the Korean War Memorial. This place goes on our list of one of the world’s best museums. 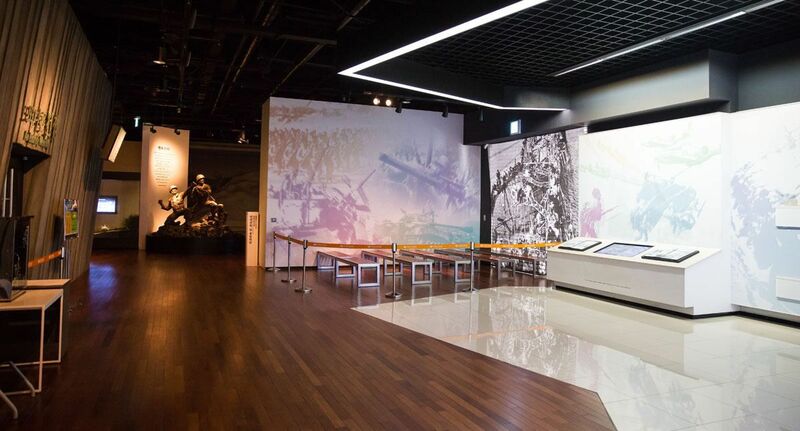 Inside a large, modern building, we learned in excruciating detail about the circumstances that led to the Korean War, how the war was fought and won, and the aftermath of the war. 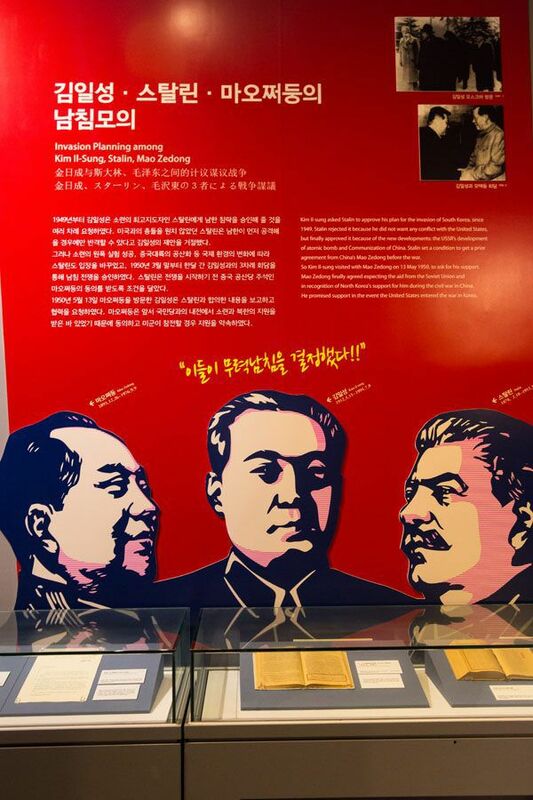 The exhibits were very interesting and well made. Some were interactive and many used modern technology to instruct the museum visitors. For example, in a small theater room, the floor vibrated to the sound of gunshots and cannons, making the movie more realistic. At the end of the film, a tank was illuminated behind the screen. The tank turned its gun towards us and fired, once again vibrating the floor. With exhibits like these, even Tyler and Kara were enjoying themselves. One of the best parts about visiting the museum was the lack of people here. The place was almost completely empty. 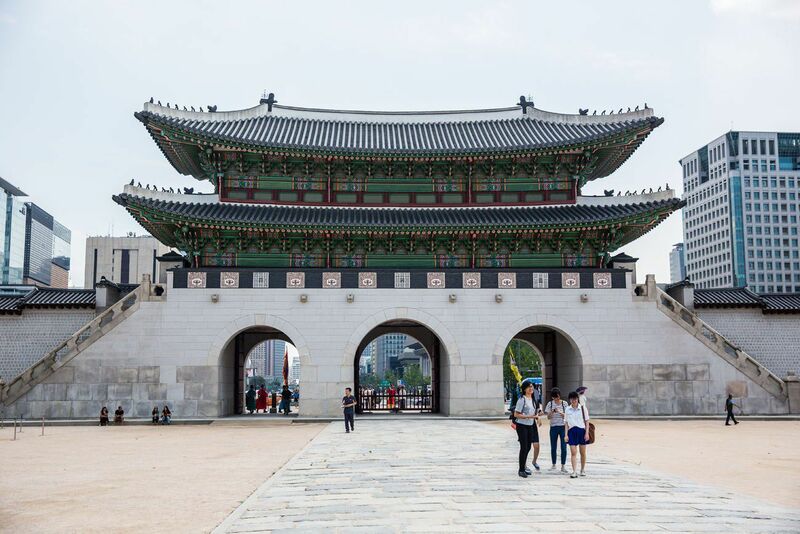 One of the advantages of visiting Seoul during the MERS epidemic is that most sights were empty of tourists. Being here during MERS did have some disadvantages as well. The number one thing that Tim and I wanted to see while in South Korea was the DMZ (demilitarized zone) between South and North Korea. Along with this the JSA can be toured, giving visitors a chance to set our feet on North Korean soil. 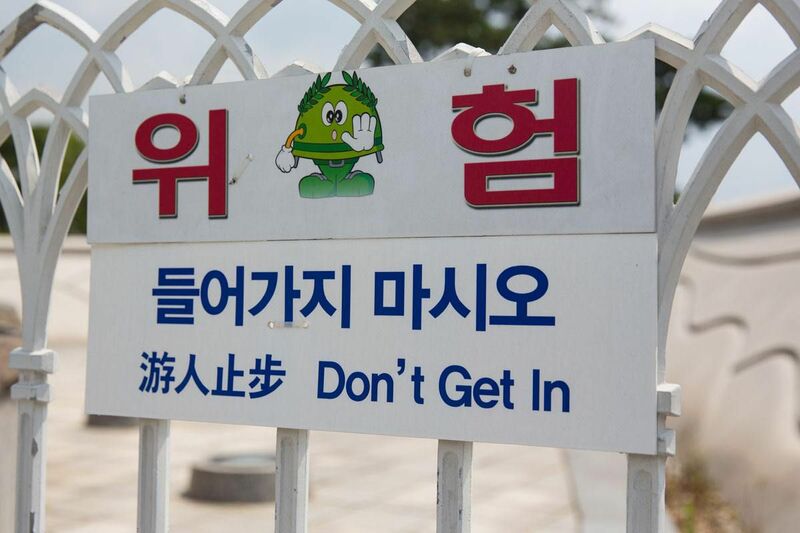 The DMZ and JSA were closed while we were here, one of the measures taken to prevent the spread of MERS. It was a huge disappointment to not be able to see these things, and it was the closing of the DMZ to tourists that had us questioning whether or not we still wanted to travel to South Korea just before our flight from Kuala Lumpur. But here we are, still finding plenty of other great things to see. Another ride on the subway took us to Gyeongbokgung Palace. 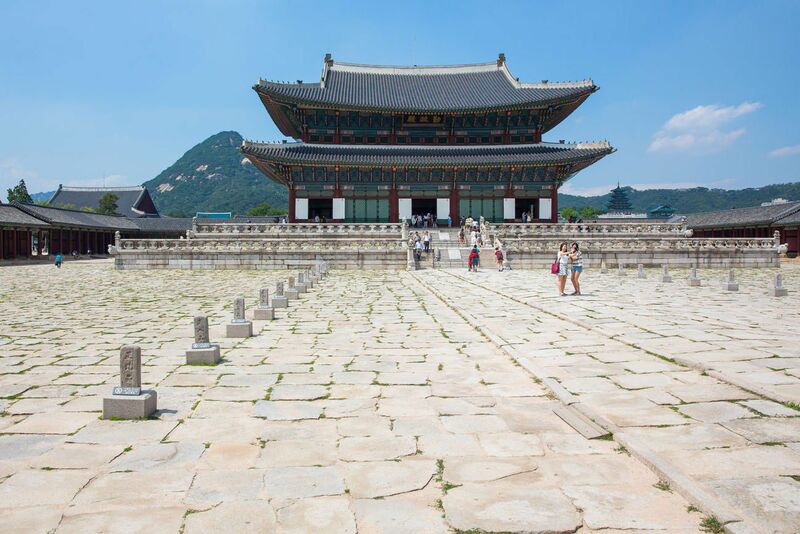 The Gyeongbokgung Palace was built in 1395 and is one of the largest palaces in South Korea. It was destroyed by the Japanese in the early 20th century and has been gradually reconstructed since then. 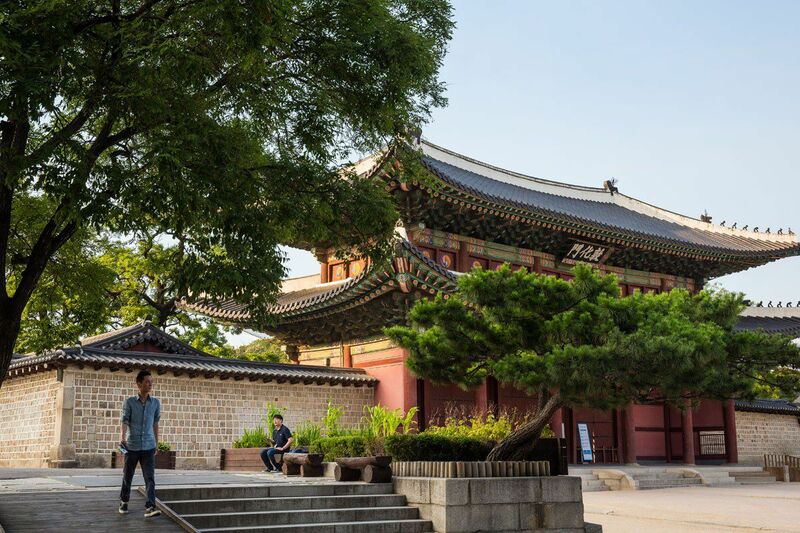 The Gyeongbokgung Palace is a huge collection of Chinese style buildings behind a stone wall, reminiscent of the Forbidden City in Beijing. The four of us strolled through the palace, taking our photos and videos, trying not to bore Tyler and Kara too much. Next up was the Bukchon area of Seoul. To get there we walked up Samcheong-ro, a street that looks like Seoul meets Europe. 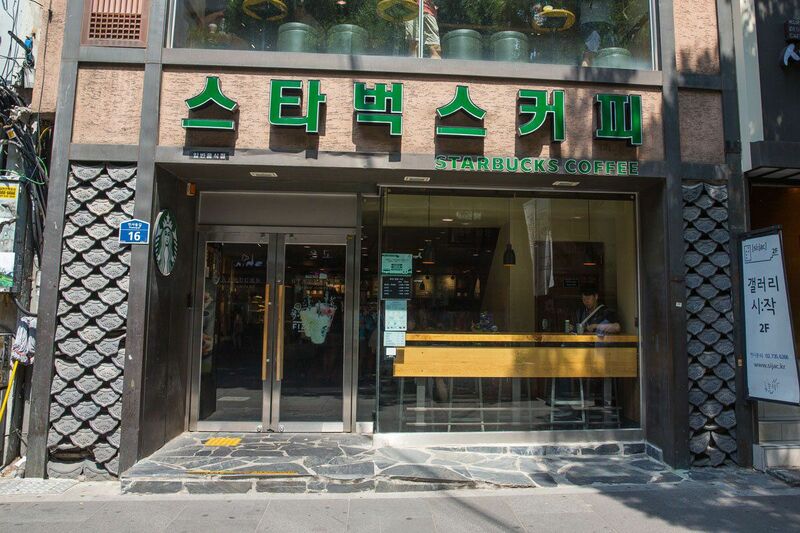 Koreans LOVE their coffee. I am not exaggerating when I say that there can be two to three coffee shops on every city block. Mixed in with these coffee shops are tea shops. The creativity at these cafes is astounding and for the next hour we all had fun café hopping. The strangest place we visited was a Jeju Tea Café. 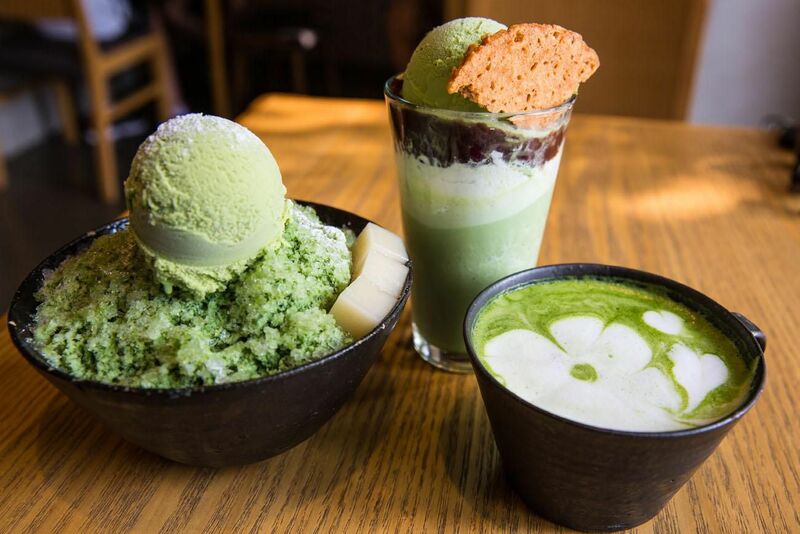 Here we tried a green tea cappuccino (odd tasting, with green tea plus coffee), Fredo-King (a green tea milkshake topped with red beans and ice cream) and a green tea ice flake dish. It was all very green and very interesting looking. Tyler called it Shrek food. It was a lot prettier than it tasted. The addition of sweet red beans to the milkshake and the ice flake dish was just something we could not get used to. 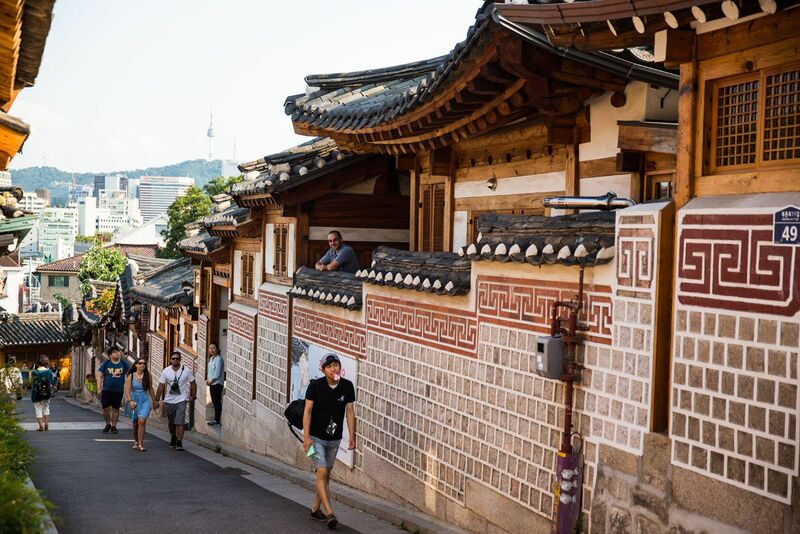 After our brief food tour we walked through the winding, historic roads in the Bukchon area of Seoul. This was a cool place to explore. Small, stone houses hidden behind stone walls lined the streets. The roofs looked like the typical tiled Chinese style roofs we saw in Beijing. There was a lot of beautiful woodwork on the upper levels of the buildings and to enter each property you had to pass through an ornate set of wooden doors. 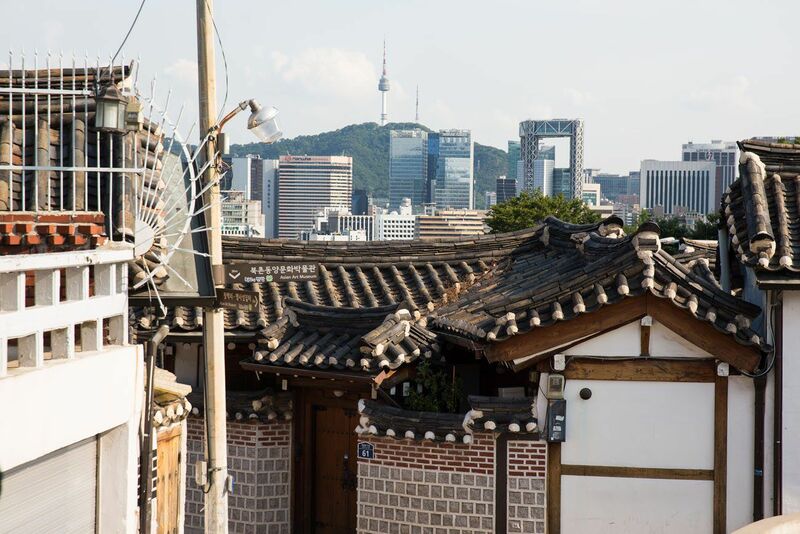 My favorite view was out over the stone rooftops to the modern city skyline of Seoul. We took too long drinking green tea cappuccinos and walking though Bukchon to make it to Changdeokgung Palace before closing time. Built by the Joseon Dynasty (the same builders of the Gyeongbokgung Palace), this was the second largest palace in Seoul. Even though it was closing time, Tim and I were allowed to take several steps onto the grounds, getting just a peek at this large complex of buildings. Tyler and Kara were ecstatic that we were just minutes too late, and that now we would be heading back to our hotel. This would have concluded our tour of Seoul, but at 9 pm Tim and I were getting hungry again. 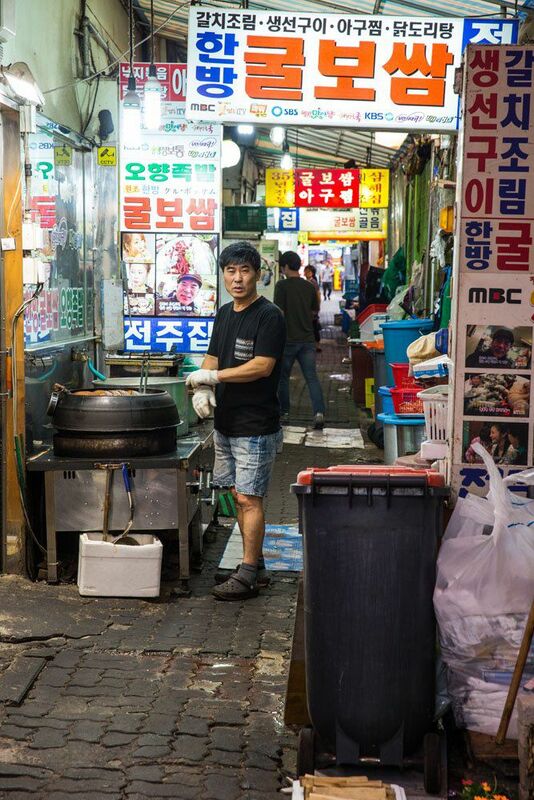 After finishing laundry, we walked out to the alleyway of small restaurants near our hotel, just for a quick snack. Leaving Tyler and Kara in the hotel, we both vowed that we would eat something cheap and quick, since tomorrow we had an early flight to Jeju. 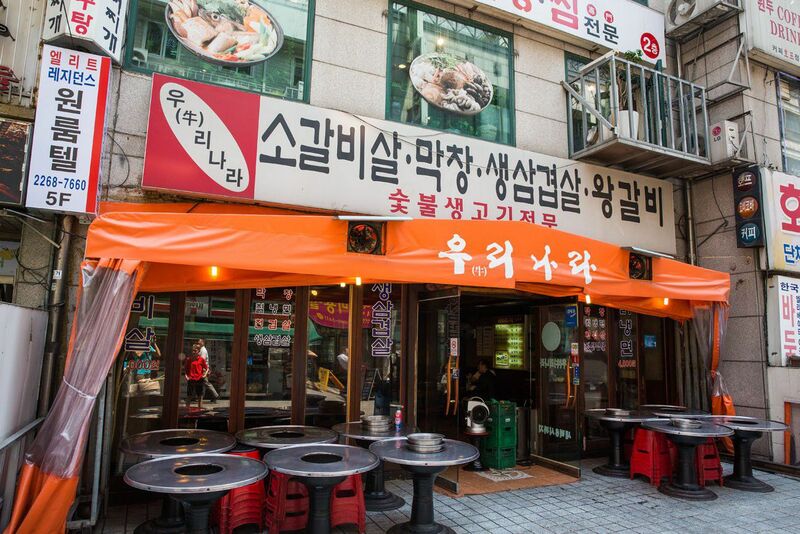 We ended up eating at a small restaurant off of one of the alleyways near our hotel. Our “quick snack” turned into a culinary adventure, eating stir fried octopus, drinking way too much soju, and making some new friends. Our late night turned out to be one of the best experiences of the trip and it was so interesting and so much fun that it deserves to be its own post. Read about it here! We spent two nights in the Doulos Hotel, a budget business hotel near the Jongno-3 subway station. We had two deluxe double rooms, which were tiny. Tim reserved the upgraded, deluxe rooms since reviews described the standard rooms as the size of shoebox. Even with our upgrade the rooms were barely large enough for a double sized bed and a desk. South Korea is known for having one of the fastest wifi networks in the world, something we all looked forward to. Somehow, this hotel for business travelers had one of the slowest wifi networks we had during the past year. We almost had the hotel to ourselves, again due to MERS, and still the wifi was crawling. If wifi is important to you, look elsewhere. 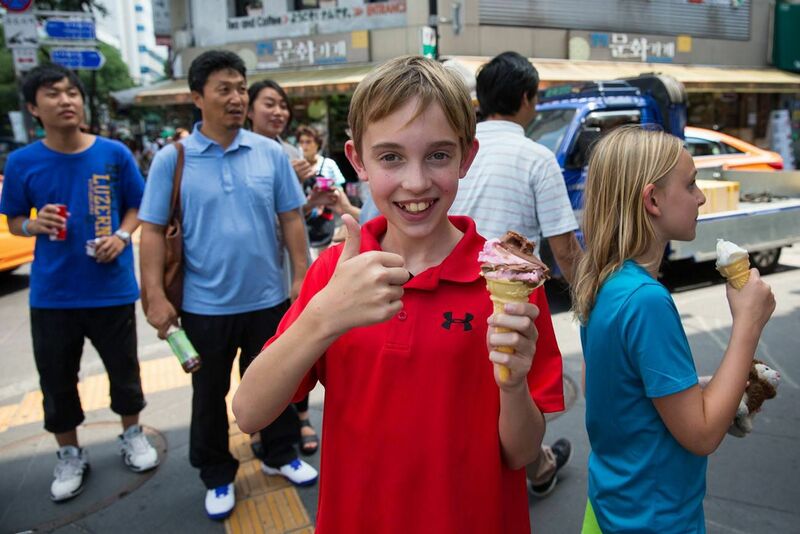 Note: We visited Seoul, South Korea in July 2015 during our trip around the world. 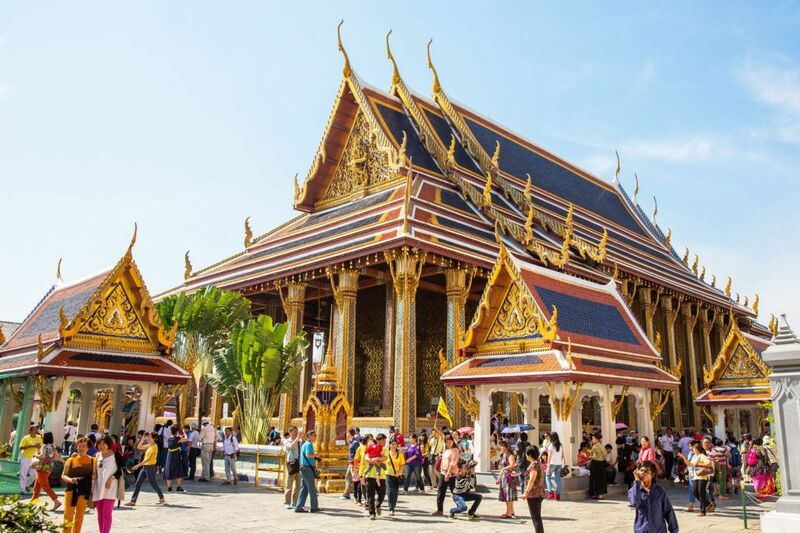 I love your blog and it has been so helpful to me while planning our trip around Asia. I was wondering how did you get from China to South Korea? Yeah! What about the family that sold their house and quit their job/took leave of absence to travel around the world with their kids?! Sounds like a good story to me! We have really enjoyed your pictures and blog over the past year, especially the areas we have also visited and are planning to go to. 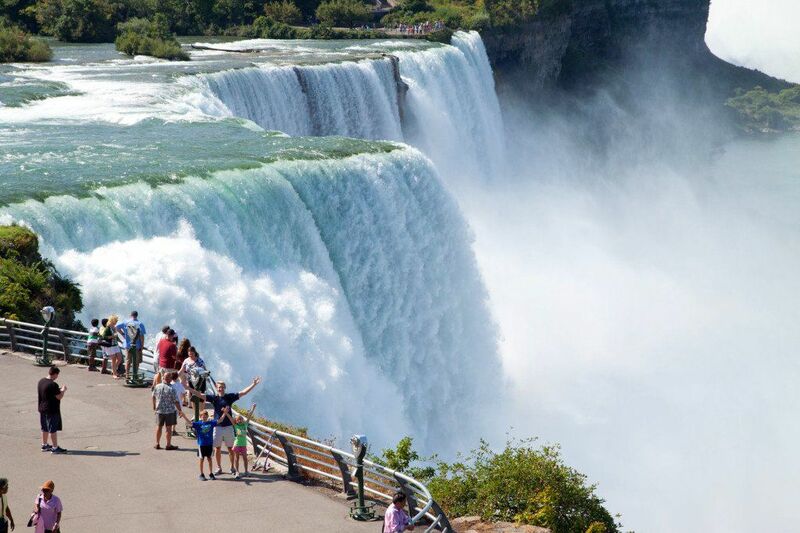 You have given us a good feel of what to expect when we travel to Australia and New Zealand this Fall. One minor correction on your caption for the aircraft in the military museum. It is not a jet, but a North American Aviation T-6 reciprocating engine trainer used by the USAF in days passed and probably given to the ROCAF during or after the Korean War. You must be getting close to the end of your odyssey, how are you going to handle coming back to somewhat normal living in or near Howard County? We have mixed feelings about returning to the US…excited to see friends and family again, sad that the adventure is over. I am sure that we will feel like tourists for a little while, even wandering around Columbia. We are going to do our best to keep the travels going, that’s for sure! Thanks for the info on the airplane! And thanks for following!